Johannesburg, South Africa – 2017 was an incredible year. New champions were crowned, athletes cemented their legacies and spectacular fights were witnessed. Before more memories are made in the new-year and all the highly anticipated 2018 action gets underway, the time has come to vote for 2017’s most outstanding. The #EFC2017Award categories and nominations can be found below. Head to the official EFC Facebook page to cast your vote for each. Presented by Samsung Mobile SA, this category is reserved for those athletes who always bring a special something extra to the Hexagon. Presented by AquaVita, giving recognition to athletes who made the most impact while debuting in 2017. Presented by Constantia Insurance, fights don’t get much better than this. Presented by Keith Ho BetXchange, the most explosive way to finish a fight. Award aptly presented by Restonic Mattresses, the sleep specialists. RDG presents the most standout athlete of 2017. Congratulations to all the athletes who competed in 2017 and thank you to all the supporters and our partners for making the biggest year in EFC history possible! 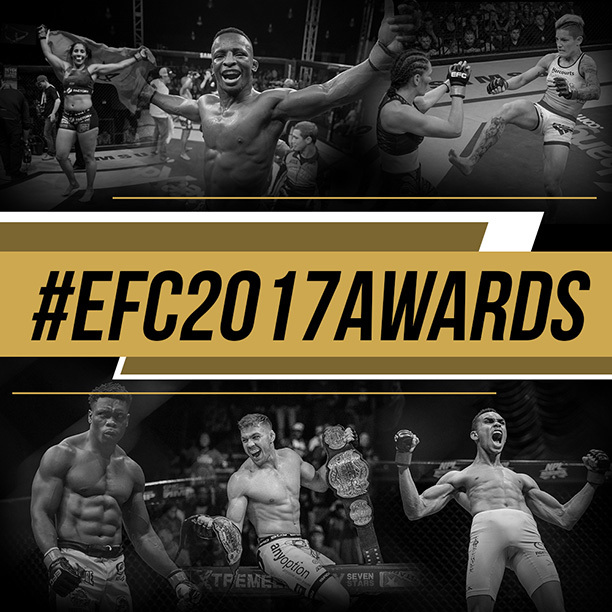 Head to the official EFC Facebook page to cast your #EFC2017Award votes now. Voting closes on Monday 19 February 2018 at 12:00pm.